Virat Kohli led the way with a sublime half-century as India defeated Australia by six wickets at the Punjab Cricket Association Stadium here on Sunday to enter the World Twenty20 semi-finals. The in-form Delhi lad remained unbeaten on 82 runs off 51 balls as the Indians survived a few early setbacks to overhaul a difficult target of 161 with five deliveries to spare. Opting to bat first, Australia made the right call to bat. And the way their openers went about their business, it seemed as if India were in for a long day. But one wicket is all it took India to pull things back, and as the rest of the batsmen couldn’t quite get going the way one had intended.On a dry surface, the Australian openers raced away to 31 off the first three overs. Jasprit Bumrah’s attempt to bowl short on a wicket that seemed to have no pace saw him go for 17 off his first over. Bumrah’s expensive over got Dhoni to bring his best bowler R Ashwin, but once he conceded two sixes from Finch things appeared bleak. It was a risk to give Nehra a third over. But Dhoni went ahead and the move hit the bull’s eye. Khawaja goes after it, edges and is taken by Dhoni. Three tight overs followed and India tasted another success with Ashwin getting David Warner out stumped for his 50th T20 International wicket. Dhoni then pulled off an ace handing Yuvraj Singh the ball. Yuvraj had the dangerous Steven Smith inside edge to Dhoni.Mohali exploded. In an attempt to hit Hardik Pandya out of the stadium, Finch was only able to find Shikhar Dhawan at long-on. With India darting through their overs, Maxwell decided to go top gear. A four and reverse sweep for six off Jadeja seemed to be doing the trick, but just then, Dhoni opted to give Bumrah his third over. Maxwell swung, and off went the stump lights. India had once again seized the advantage. Pandya returned to pick up Faulkner in the final over, but a couple of late fours and a six from Peter Nevill gave Australia 160 for 6 in their allotted 20 overs. Chasing 161 for victory, Indian openers Shikhar Dhawan and Rohit Sharma got off to a steady start. But just when india looked to be in command, calamity struck. Dhawan was dismissed by fast bowler Nathan Coulter-Nile. Shane Watson gave Australia their second breakthrough. Rohit Sharma failed to read a fine cutter from Watson, and the ball shattered the stumps. Watson was again in his element.Suresh Raina was dismissed for mere 10 after being caught behind by Peter Nevill. Yuvraj Singh and Virat kohli then steadied the innings and kept the run rate always at control. Yuvraj, meanwhile, got injured and that hampered his movement. Yuvraj was finally dismissed for 21 by fast bowler James Faulkner, after being caught by Shane Watson at covers. In came MS Dhoni. Two of World’s best finishers of the game Good thing for India the two of them were together in the dying stages of their quarter-final against Australia in Mohali. 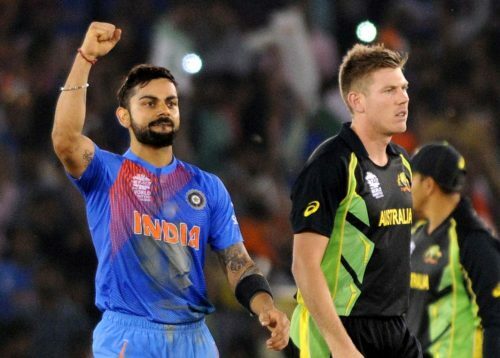 Kohli lived up to the hype of being probably the greatest chaser in the history of the limited-overs game by scoring a fiery unbeaten 82 in 51 balls under immense pressure to guide India to the semifinals of the ICC World Twenty20 2016 with a six-wicket win over Australia. Mahendra Singh Dhoni’s 10-ball 18, that carried India to a win which seemed improbable at one stage. Dhoni’s men progressed to a semi-final, against West Indies, and ended Australia’s World T20 campaign, and the international career of Shane Watson.